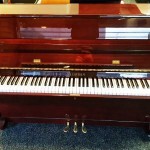 Upright piano manufactured in Japan by Yamaha, finished in polyester mahogany. Yamaha U1 with factory fitted MX100ii Disklavier system. Fully functional in superb condition. The Disklavier mechanism does not affect how the piano plays manually and should be considered as a bonus feature. This Disklavier system has MIDI functionality. 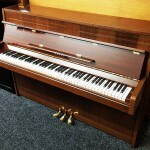 Excellent entry level/intermediate piano, built to a high standard. Finished in gloss mahogany. 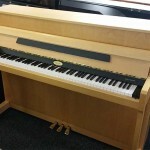 Manufactured in the United Kingdom by Yamaha, finished in Oak. Beautiful condition. 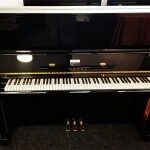 Professional class upright piano manufactured in Japan by Kawai. Finished in gloss black, excellent condition throughout. 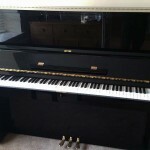 Upright piano manufactured in South Korea by Daewoo. Finished in gloss black. 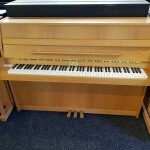 Excellent condition, very good entry level to intermediate upright piano. 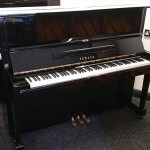 Upright piano finished in black gloss, manufactured by Yamaha. 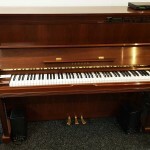 Top of the “b” series range, this piano was built to offer an alternative to older imported Yamaha U1 pianos. 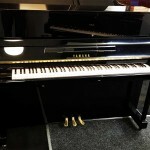 Upright piano manufactured by Yamaha – Kemble in the UK. Finished in Beech. 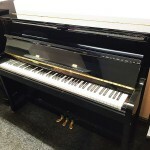 Excellent quality piano, manufactured around 2005.